Today I spent roaming in the sunshine, getting my bearings. I rolled alongside Sumida and headed for Ginza. There are more cyclists weaving along the pavements, more mobil-phonists standing in awkward places and I do believe more wheelchairs in evidence. I have discovered that Japanese department stores regularly host art exhibitions, and just past Ginza I did indeed see evidence of a Japanese artist, possibly inflenced by Klimt and Picasso, exhibiting on the sixth floor; what a great idea. 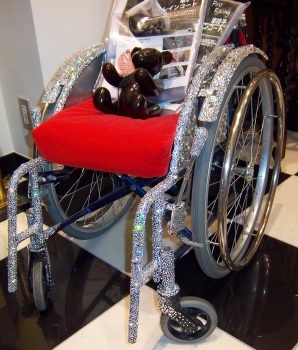 The artist didn't grab my attention, but a sparkling, jewelled manual wheelchair did. Positively bling - I loved it! On one of the designer-wear floors, tucked between international Names, sat this transformed duckling just waiting to party. Covered in crystals, it was the focal point of a section devoted to 'sit-friendly' clothes for chairborne people. And knee bags - I think I might want one! here, the hype has begun.